Symphony Orchestra of Southwest German Radio, Baden-Baden. Few apologies need to be made for the sound quality on these two performances from the end of Horenstein's series for Vox in the 1950s. In fact that of the First Symphony almost rivals the sound given him in a later recording of the work made originally for Readers Digest with the LSO. For a long time a leading contender in the choice for this cornerstone work when it was released on an RCA LP. It is certainly a work Horenstein had a high regard for and his interpretation emerges with every aspect covered in a wonderfully coherent, classically argued view. The timps produce a well-integrated tread in the introduction rather than battering us into submission like some versions. Here the drums are made to be another colour in the mix, a familiar Horenstein fingerprint. As so often, he knows how to marshal his forces, when to keep some in reserve, when to unleash them. In fact it's the strings that deliver the tragic message at the start and they stay in our minds for far longer. The main exposition that follows is as good an illustration of another major characteristic of Horenstein's style as you could wish to hear. As so often, he has chosen a tempo that will unerringly seem to suit the whole span of the movement and he will stick to it, varying only slightly and occasionally when the composer demands and never when the whim takes him. The development that emerges thus seems to possess a tensile strength and also wholeness in the way Horenstein doesn't neglect the middle registers with the double bassoon especially rich. A noble restraint hangs across both middle movements. There is some fine solo horn playing to the fore at the start of the third and a very chaste oboe in the second. Some may miss the more tragic grandeur someone like Furtwangler brings to the slow movement in particular, some may prefer the refinements of Karajan, but Horenstein's blend of romantic warmth and classical strength has its place. He then builds the introduction to the fourth movement most carefully and steadily in a series of graded steps so the arrival of the great horn solo seems a goal inevitably won rather than forced on us as it sometimes can. Notice how Horenstein keeps his timpanist under control here too. What he seems to want is not a percussive noise but a very musical sound to add to the mood he is trying to convey. Note again the special attention that is paid to the double bassoon. The peaks of this movement are delivered with splendid drama that is more impressive for the care with which they are built to. As so often with this conductor's recordings, don't expect to be bowled over on first hearing. 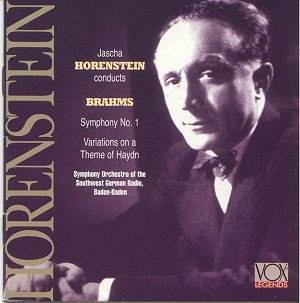 Horenstein's recordings invariably need time to be made aware of their rightness. The Haydn Variations that complete this disc are notable for their elegance and charm with Horenstein showing a lovely feel for the melody of the main theme itself. The stereo recording is like that of the symphony, full and well balanced with some especially good woodwind solos well caught. The short fifth and sixth variations are both marked Vivace but I admire Horenstein's very mordant readings of these - powerful without sacrificing propulsion. Then the Grazioso of Variation Seven sees some beautifully long-phrased strings, so typical of this conductor who must have rehearsed them especially to produce this glorious effect. This performance is a real pleasure from start to finish. In fact the whole disc is a gem that I cannot recommend too highly. Sound-wise it has a few problems but no more than many recordings from the late 1950s have and the remastering has come out superbly.